Mango, a.k.a. Windows Phone 7.1, is served - along with 500 new features. Multitasking is among them, as is much deeper social networking integration, improved message handling and more. The WP 7.1 update will be shipping on new phones this fall and it will be made available to existing Windows Phone 7 users for free at the same time. And there will be new devices to come - aside from the widely publicized deal with Nokia, Acer, Fujitsu and ZTE will be making Windows Phone 7.1 devices too. Nokia also confirmed their first Windows Phone devices will come with this edition of WP7, so the features listed below will be available on those phones as well. We recently heard Nokia's WP7 phones will use ST-Ericsson's dual-core CPUs, however Microsoft today confirmed they are sticking with Qualcomm's Snapdragon CPUs for the new batch of smartphones. While that's not bad, we'd really like to see custom SoC solutions from manufacturers. With all the same hardware, manufacturers will find it really hard to differentiate their products but we guess, it makes sense from the software development point of view. It just remains to be seen whether Nokia will be the only maker to use chips of its own choice. Getting back to the promised changes, Microsoft has added a long list of supported languages to greatly expand the reach of Windows Phone to new countries. The limited language localization offered so far has been cited as one of the reasons for the somewhat poor WP7 track record. Multitasking is, of course, one of the most hotly expected features. It uses a card interface to switch between apps, very similar to what we've seen in WebOS. Messaging is done on threads, combining various services - within a single conversation you can switch between SMS, Facebook chat and Windows Live Messenger seamlessly. Now that's new. We like innovation like that though the actual implementation by the users will be tricky, that's for sure. Other messaging changes promise you will be able to dictate your messages or have an incoming text read to you, thanks to the text-to-speech and speech-to-text features. Twitter and LinkedIn has joined the social networking prowess of Windows Phone too and Facebook check-in functionality as well as face tagging in photos are built-in. You can pin whole groups of people as live tiles and monitor updates from people in the group or message the whole group right from your Start screen. Live tiles are improved in general - they will display much more info than their v7.0 counterparts. App connect helps third-party apps integrate into the Hubs of Windows Phone 7.1 to enhance the core experience of the phone. Apps will also be included in search results, making search in Mango much more context aware and hopefully useful. Check out our coverage on the new search features here. 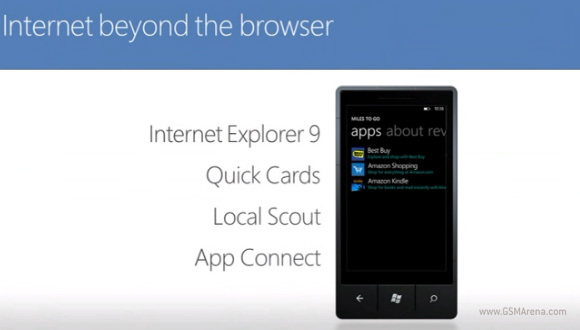 Internet Explorer 9 is coming with the Mango update too (it's based on the capable desktop browser). IE9 for Windows Phone 7.1 supports hardware acceleration. Bing services have been extended - Bing Vision (think Google Goggles), Music Search and Voice offer new ways to search the web. A curious new feature, called Quick Cards, will give you instant access to key information (including related apps) whenever you search for a product, place, event or movie. Local scout will help you find what you need nearby - shops, restaurants or activities will be recommended in an "easy-to-use guide". 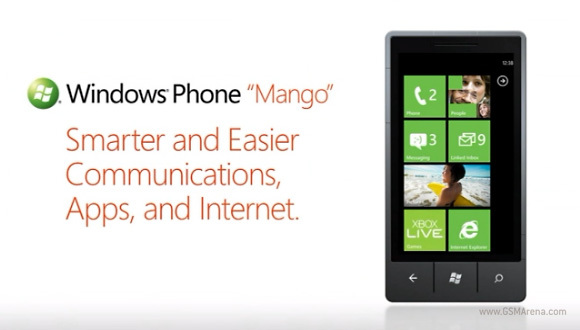 You will find an excellent video detailing all the major stuff in WP7.1 Mango in a video over at our blog. Faulty phone,no support adobe flash,can't do anything! !